It is mandatory for Grant Recipients to report and account for their financial expenditures. This provides the essential information required to facilitate the completion and submission of the mandatory Federal Financial Report (FFR). The Federal Financial Report (FFR) consists of both the Federal Cash Transaction Report (FCTR) and the Financial Status Report (FSR). Adjustments to cumulative disbursements may be saved (to be completed at a later time BEFORE the deadline date) or certified. If the FCTR is not filed before or on the due date, funds will be frozen until the report as been submitted. 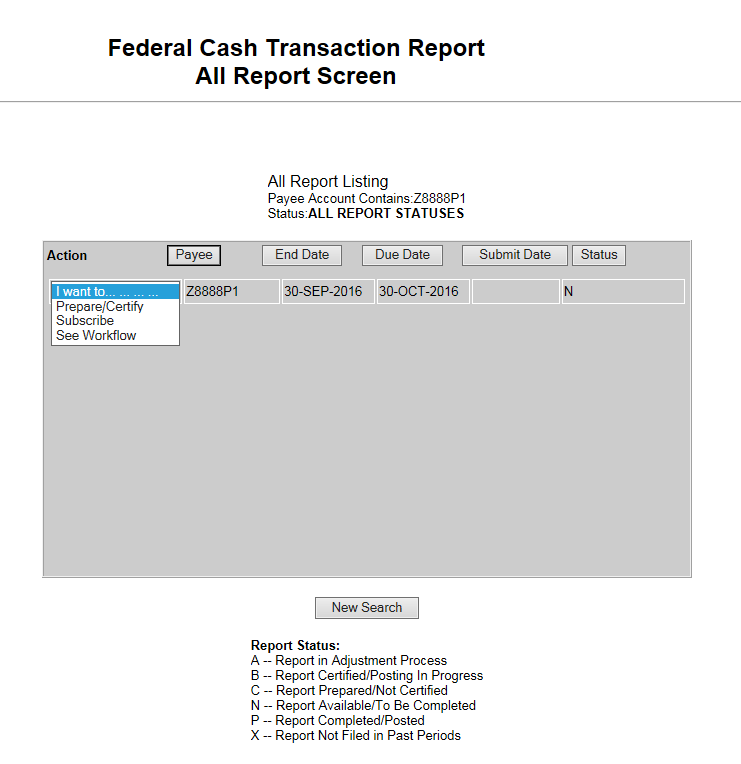 Select the PMS menu heading entitled: "Disbursement"
Select the sub-heading entitled: "FFR Cash Transaction Report"
Select the Reporting Period "All"
NOTE: System will display desired selection information. You can only complete the current quarters report. If status is "X", the report is no longer available for submission. PMS will automatically populate Agency, Grantee Information, DUNS, EIN as stated in the database. Box 6, Box 7, & Box 9 are defaulted automatically by the system. 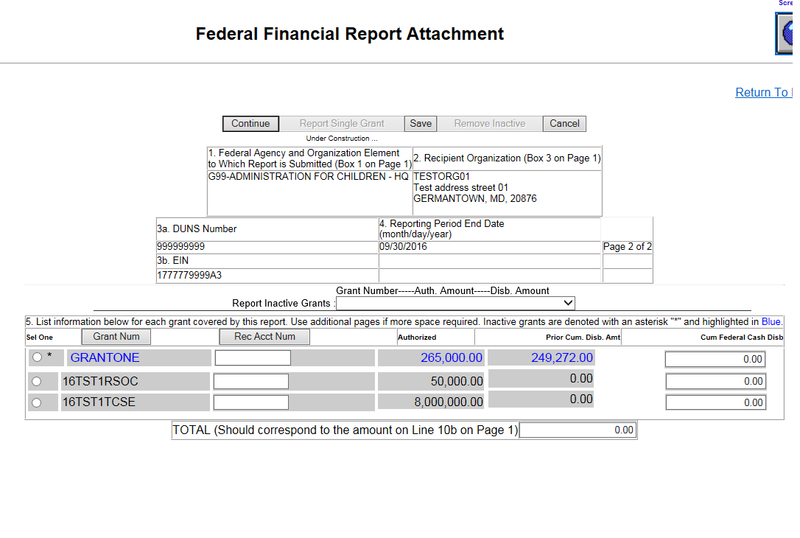 To report disbursements on the grant, select "Report Disbursements" button at the top of the page. 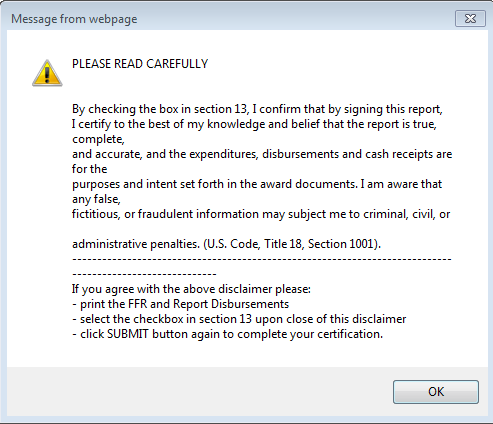 The Report Disbursement page must be completed first. 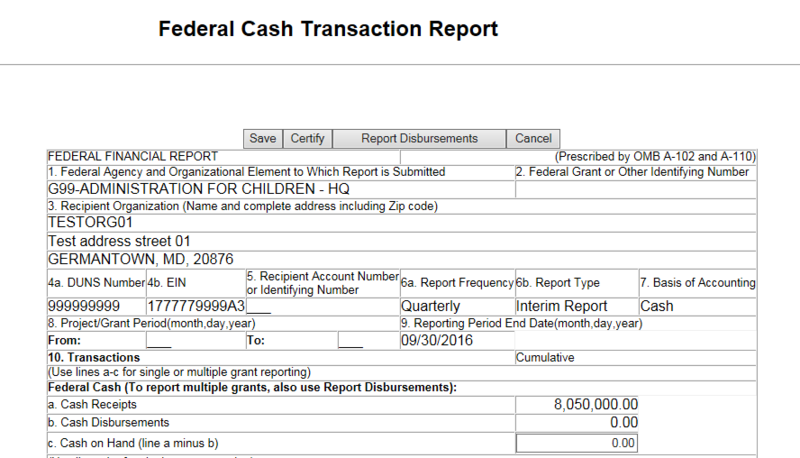 In Box 5, report "CUMULATIVE" expenditures for each grant listed. Net Quarter Disbursements will automatically calculate at the bottom in the box titled "TOTAL"
NOTE: The Rec Acct Num column is optional. This is for your use only! However, PMS will retain this information and it will populate on each quarters report. Remember this is an expenditure report. 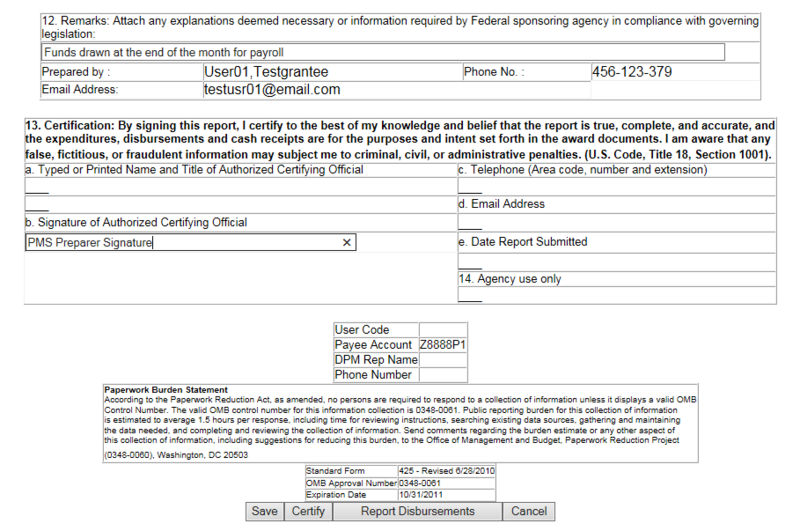 You must report actual expenditures regardless if you have not requested funds. 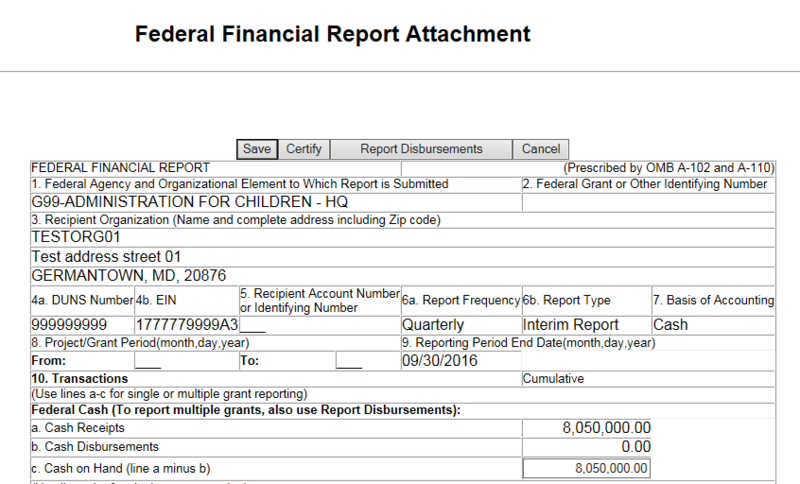 "Report Inactive Grants:" option allows grantee to report on the inactive grants. This is a drop-down option from which the grantee can select their inactive grant for which they need to report disbursements. "Report Inactive Grants:" options showing grants available to select. When grantee has selected the inactive grant from the drop-down then it will appear in the grid in blue color. Line 10a: Cash Receipts = the Ending Cash on Hand from the prior quarter’s report + funds received and/or returned during the quarter. You must calculate 10c "Cash On Hand" Line 10a minus Line 10b. Scroll to the bottom of the page to enter remarks, if applicable in box 12. Enter Certifying Officer’s name in Box 13b. 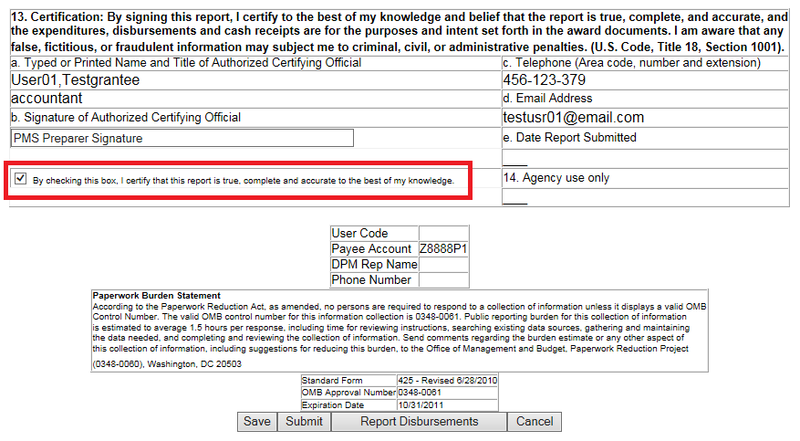 Scroll to the top or bottom of the page and select "Certify" to attest to the accuracy and completeness of the report. Read Windows message and select "OK"
Under box 13b, Select the option for certification Select "Submit". 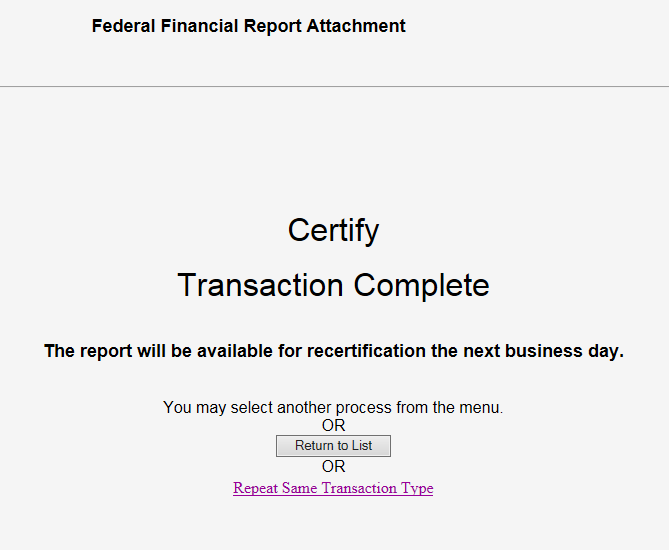 Once report is submitted, the message "Certify Transaction Complete" will appear. Updates to the report, can be made 24 hours after submission. Your report has now been submitted. You can select "Return to List" to see the updates status of your report. If you missed a past report, you must complete the current quarters report in order to be compliant.